I was trying to work hard the other day when my husband, Phil, mentioned to me that he had been listening to a song called Jessie by Mother Earth. It suddenly made me think of a song my mother used to play when I was younger, also called Jessie, by Joshua Kadison. Jessie paint your pictures ’bout how it’s gonna be. By now I should know better, your dreams are never free. Jessie you can always sell any dream to me. Oh, Jessie, you can always sell any dream to me. I know it’s not an entirely postive song about this girlie, Jessie, but it is about someone that dreams big and is willing to give it a go making those dreams happen. It just struck me that people often refer to me as a dreamer, someone not afraid to take a risk to see a dream come true either. The songs rather apt, as well as me sharing the name and it made me stop and think for a bit. Anyone else have songs they listen to and it reminds them of themselves (not just because of the name of the person being sung about)? A voice in the wind is the first book in the Mark of the Lion trilogy by Francine Rivers. The books are set in the Roman empire in approximately 70AD and the first book mostly follows the life of a Christian girl called Hadassah as her family are killed and most of Jerusalem is destroyed. It then follows her journey as a slave to the Roman Valerian family and her struggles as a Christian in their very self centered lives. For the most part I enjoyed this book. It’s a very endearing journey to see Hadassah learn to love others and find her place despite the tumultus beginning to her life. I also found I couldn’t help feeling her respect and love for the older children in the Valerian family, Julia and Marcus, despite their large flaws. Francine Rivers is very good at painting her characters in a very real light making them easily relatable to. Although many of the characters have a very obvious flaw or two I was impressed with how they dealt with them and how everyone managed to grow somewhat by the end of the book. I did find the plotting a little slow, with the odd over zealous reference to God and scripture, almost as if it was a little forced in. I think it got better as the book went on, however, as the situations the characters faced, gave more of a reason to mention their reliance on the dieties they believed in. My biggest problem I had was with the ending. I was extremely glad I had the second of the trilogy to hand and I strongly recommend that anyone who reads this book immediately reads the first part of the next one. Without spoiling the plot, I found the characters in a situation at the end that implied one thing and then found this not to be true on reading the first chapter of the next book. I think I would have infinitely prefered it had it not implied one way or the other at the end of the first book. I’m interrupting the normal blogging schedule to ask people for some help with something. I’ve recently been exploring many different options to get my first book in print. The good news is that I’ve decided upon one. The bad news is I therefore need to update my front cover, as the ebook version already done won’t actually stand up to the high res test needed for a print run. This is where all of you come in. I need to gather every item in my cover picture into one place and take a bunch of photo’s. As you can see that’s not an entirely normal set of items. Rose: Well I’m sure I can buy one of these come photoshoot day so no worries there. Playing cards: I really need these to be as old as possible as I need them to look like they are from early 19th century. Dirty and well used is good too. Again I only need to borrow as these can often be collectors items. – Acquired. Hemp rope: I need at least 1 metre of this, borrowed/given. Hand: I think I’ve got that one covered. Just. Background: I’d really like to use something made from a dark wood like Mahogany or dark oak as the background. Will need to be something bigger like a table or coffee table so all the items can rest on top of it and I don’t actually want to keep this at all. If I can would prefer to just turn up somewhere with me and a photographer and use someone else’s furniture. And what do you get out of it? Well since the book is about to be in print, anyone that helps will get entered into a prize draw for one of the very first signed printed editions of the book (if lots of people help I’ll give away more copies). If people know useful info they can either comment below, facebook or tweet me. If you comment remember to give me some way to contact you in case you win. I’ll obviously be running this giveaway of sorts until the book cover is done and uploaded and will do the draw as I close it (winners will have to wait a bit for their prize, however, as it takes a few weeks from me submitting everything before I get physical copies in my hands). My starting place for each fresh idea is always with the main character. To me it is the most important part of having a good book or film. If people don’t connect with the character and cannot relate to them, no matter how good the plot is, chances are the reader/viewer won’t enjoy the product. I’m not saying plot isn’t important though, it’s very important, but I’ve found time and time again the plot actually comes out of getting my head around my new characters. Knowing how they think and react moves the plot along in a believable way. Recently I posted a blog of the character biography of the new books main character. Today I want to run through how I came up with Marie Woodell from my first book, With Proud Humility. The first place I always start is how they look. I write this so that I am consistent when I talk about my character from the start of the book to the finish. So how tall is she, length and colour of hair, clothes she likes to wear/has to wear, age etc. In Marie’s case that was fairly simple. I already knew I wanted her to be a member of gentry, that makes most of this pretty easy. She needs to be single, so age has to be between 16-22 to be socially acceptable. Clothes would be whatever her status dictates, likewise with hair length. I arbitrarily assigned her height to be 5’7”. Once her background is fully decided upon as well as the other influential people in her life I can start moulding her actual personality. Often certain big events in a person’s past have an influence on their character. For example I needed to know how Marie felt about her mother’s death. Did she want revenge, or did it scar her so badly she doesn’t now trust anyone, or possibly even both? How does she react to being raised just by her father? At this point I also tend to decide the full name of the person. Often this can take several hours as I trawl through baby name databases trying to find names I like the sound of, as well as names that have meanings that I think work with everything else I’ve decided on so far. I confess in Marie’s case it was much simpler. My mother intended to call me Ann-Marie before I was born so my new character was being called Marie. 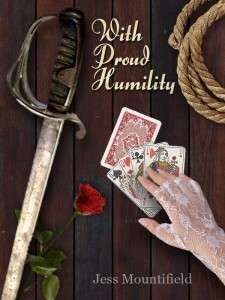 In the case of Marie it was also her personality that led to the book’s title, With Proud Humility. If I struggle to form the character as I did with Kaihaitu, I’ve found the best way to get through that and shape them is to essentially introduce someone else to them. Chrysalis kindly sat up late one night on Skype with me till I think about 2am in the morning, asking me question after question about Kaihaitu, similar to the questions above and I answered them, allowing her character to form in my attempt at explaining her to someone else. Finally when I’m happy with all my questions and their answers I put it all together and move on to any characters I’ve discovered are likely to be a major role in the book, based on their relationships to my main character. Usually by the time I’ve done this my plot’s fairly well worked out too. Add in some conflict, some pain, some tears and voila most of the book prep is done. For those that wish to know what I decided to the above questions though I urge you to check out the book (no spoilers here). There is now a 40% free sample on Smashwords and it’s on sale on Amazon at just over £2 per copy, that’s less than the price of a hot chocolate. March seems to be flying by and with breaking the 30k words barrier on my new novel I have hardly done much else. Last Saturday, however, my lovely in-laws came over, forcing me to take a much needed break. Their suggestion of what we could do was Geo-caching. I’d vaguely heard the word being thrown around but had no clue what it was and I imagine right at this point you’re wondering what on earth it is too. Well it’s most easily described as the modern version of a treasure hunt. Now that makes it sound infinitely cooler (I really think they could have given it a better name). If you wish there are also extras and variations of this basic idea. Some caches have what’s called a travel bug in it. These are seperatly packaged dog tagged things that each have their own mission. Some will wish to be put in every cache in a country, others to simply go to as many countries as possible etc. If you take these to move them on it needs to be done quickly and needs to be logged on the website, that it’s in your possession, and where you then put it. There are also puzzle caches that require you to solve a puzzle to get the next location and then the next etc, until you finally find the cache at the end location. With multicaches being a similar variant of these with clues instead of puzzles. Needless to say, I loved the idea. I love walking, countryside, puzzles and most of all feeling like an old fashion pirate hunting for treasure (well I do write historical fiction, check out With Proud Humility for evidence of my love for treasure hunting). You can imagine how much I grinned when the first thing I saw in my first cache was a toy Jessie from the Toy Story trilogy. I can see myself getting very very distracted by this passtime, especially as there are just under 1000 caches within a 10 mile radius of my house. If you like the sound of this and want to check it out you can here, who knows, maybe I’ll see you out there, searching around tree stumps and mountain tops for random objects half the world doesn’t even know exists. Until last year I had never watched or read anything to do with Sherlock. The little I knew about him at the time consisted of him being a detective of crime who wore a deer stalker hat and had a doctor for an assistant. I don’t particularly like crime books or tv programs. I usually find the characters quite dull and samey and the plot lines a little stretched. Naturally I had dismissed Sherlock as being just another one of these. In January 2010 I watched the film of Sherlock with Robert Downey Jr as the dashing Mr Holmes. While I was still left with a slight feeling of this being just another random plot that wasn’t amazing and Sherlock was nothing that special, I was impressed that the film managed to get across how Mr Holmes saw certain things coming, just from observational clues, so he could forward plan for them to be prevented or encouraged (as he desired). This was the over all impression I went away with, nothing great, but an underlying, perhaps unappreciated gift that Holmes had for observation. Then I saw the BBC version of an updated Sherlock Holmes. Suddenly my whole opinion was turned upside down. Sherlock embodied something I couldn’t help but love. He was arrogant, rude, incredibly untactful, deliberately antagonistic to anyone he didn’t like and blunt to those he did; and I fell head over heels in love with him for it. I can’t entirely explain what it was I liked so much about this version of Sherlock, played by Benedict Cumberbatch, but he captivated me and I watched every episode at least twice each and some of them more, within the space of only ten days. After spending a month or two thinking I then devoured the entire set of books and stories. I then spent another month thinking. From that point on I decided to make it my mission to figure out why exactly this character resonated so strongly with me and I think after a total of six months processing I may finally have figured it all out. I want to challenge Sherlock Holmes. I want to fight him and I want to lose, just. I naturally really enjoy dissecting characters and trying to figure out what the author intended him to be like and with Sherlock I was in heaven. Where other people saw his rudeness to people like Dr Watson I saw a care that ran so deep that Sherlock was doing everything he could to keep Watson safe, even if that included pushing him away on occasions. I essentially Sherlocked Sherlock. And not just from one point of view. I looked at him from the author’s point of view as well as the actor’s. As I thought more and more about Sherlock I realised that he lives for only one thing and it totally consumes him. He’s so passionate about doing what he believes to be his ‘higher calling’ in life that nothing else really matters. He also appears to be both left brained and right brained. In the sense that he is both logical and yet very creative. There is nothing better in his eyes and nothing I enjoyed watching/reading more than the parts when Sherlock was getting to use both sides of his brain at the same time. He was so alive and aware that he was doing exactly what he thought was the best use of all of his life skills. He had created the perfect job out of knowing exactly what he was good at and combining them all into one task. I guess you can say I felt challenged by Sherlock’s character as a person. Sherlock embodied some of the things I value about myself. I too enjoy using both sides of my brain. It was one of the sole motivators for my new language. It was even more than that though. It was the journey the author went on as well. Reading through the written works in chronological order showed not just an evolving Sherlock but the author’s evolving idea of who he was and by the time it reached the end Sherlock was a masterpiece of character creation. Not only did the author turn Sherlock into a genius people could love and hate at the same time, he managed to knock off some of the rough edges and still keep the feel of the character consistent. Now before anyone gets really worried I’m not about to turn to a life of crime and become the next Moriarty. I don’t actually view Moriarty as a good nemesis, and therefore a good role model. I think Sherlock would be infinitely more threatened by someone solving crimes better than the great detective does, than someone actually challenging him to solve their crimes. I want to respond to the challenge I felt Sherlock was issuing to me. The challenge of using both sides of my brain to their full potential, to use all my varied skill set together in one task and to analyse situations, circumstances and people so accurately from the clues the world naturally gives that I can stay one step ahead of anything that comes my way. And the reason I want to lose despite wanting to fight him, well if I was the best where would the motivation be? Clothes: Hides, loose but reasonably covering. Bare feet. Background: Kai grew up in her father’s village. Her Father was the village leader and she has grown up knowing that she will one day lead the village herself. Her mother was a housewife who looked after Kai and her younger brother. From a very early age Kai was trained by her father to be both a good hunter and a good leader. As such Kai doesn’t really have any friends. She is usually too busy working to socialise. Her main companions are the two monkeys, Hehu and Matiu, that her father traded for and gave to her as a coming of age present when she was fifteen years old. When Kai was very young a redcoat ship turned up and not long after that they built a fort near the village. At first the relationship between Kai’s village and the redcoats was amicable and many trades were struck. Kai was even encouraged to learn English by her father. Over time the redcoats slowly encroached on the village’s land and the relationship deteriorated. When Kai was approximately twenty she, along with several of the other young villagers, raided the red coat fort. The following day the village is celebrating their ‘victory’ over the red coats when they retaliate and storm the village in far greater numbers than the villagers have ever seen of them. As an example to the rest of the village, the red coats take back their food stocks and more and destroy things important to everyday village life. Her father then dies from an illness and lack of food and Kai is left to lead the village and to try and get them through the winter coming with very little food. Kai blames herself for her fathers death and the subsequent villagers deaths the following winter, but does not tell anyone it was her idea to raid the fort. Instead Kai uses her guilt to fuel her leadership of the village and she dedicates herself to getting the village back on level ground and an unstable truce is formed with the redcoats again. Her mother and most of the villagers wish for Kai to marry a guy called Henare and although he is a very eligible bachelor and encouraging towards Kai, she is just very uninterested in marriage, let alone Henare. Personality: Kai is a very quiet, reserved person. She feels the weight of her responsibilities and has from a very early age. Kai doesn’t have many friends and does not find it easy to socialise with other people. Although she is very adept at dealing with the villages social problems any other form of communication with people is very difficult for Kai. With the higher responsibilities Kai has faced she is much more mature than other people her own age and very calm and considered in her approach to solving problems. She always appears very relaxed even when on the inside she is not. The only time Kai lets herself be more vulnerable is when she is alone with her two monkeys. She will occasionally play with them and be light hearted, but only when she is sure no one else is around. This has been rare the last year or so for two reasons, firstly the death of her father and the constant danger to her village, has made her more serious and secondly Henare often pops up randomly to talk to her, and the only warning she gets is Hehu and Matiu running off. Hehu and Matiu running from Henare fuels her choice to push him away from her, though she knows she is being mean in doing so. Kai trusts their judgement and for this reason alone would never marry Henare even if she thought he was a good match for her. Though Kai is not unhappy with her life in the village she can’t really be said to be happy either. She is very much a realist and knows that she has a tough time ahead of her to get the village through. The villages safety is more important to her than her own happiness. Kai is also a well trained hunter and fighter though she has a good respect for life and would only kill in self defence or necessity for food etc. She is rarely seen without her bow and arrow and always has a couple of hunting knives about her person somewhere. Writing is an art. This is a fairly well accepted statement, but what does it mean for an activity to be an art? Some say art cannot be wrong, it is just good or bad. If a painting is called “dog” but looks like a cat, it is not wrong as this is viewed as the artist’s impression of the dog. This can only happen very rarely in literature, as grammar and general comprehension is necessary to ensure some enjoyment for the reader. The Jabberwocky poem, for example, comes close to this by inventing new words that have no meaning, but you can still understand the vague meaning behind it. So can writing be correct within the context on comprehension? The interesting thing about comprehension in writing is that it’s not always intended. The writer can often leave ambiguities in their work to create some effect, either to allow the reader some freedom or to leave things undiscovered. It is part of the joy of the English language that there is so much room for ambiguity, poetry and multiple meanings. On the other hand, making everything so clear that there is no doubt as to what the writer sees is often very tedious to read. It is perhaps this that makes it an art form; finding the delicate balance between too much and too little. Take for example the statement “there is a cat on the mat”. It is perfectly adequate to convey the idea, but it is not attractive to look at nor an enthralling idea. It gives you almost no pleasure in reading it, as the person who wrote clearly did not put much effort into writing it. You can take nothing from it, as there is so much that you have to do with it to make it exciting that it requires more input than you expect to get out. Compare this to, “Magnum’s back was bent in what looked a most uncomfortable position, but her purring seemed to suggest the opposite was true.” Here you can imagine more clearly what is compelling about the subject and get an impression of the person saying it too. Altogether, it is much more provocative and involving. It is this that makes it art. The fact you can take enjoyment from it, without any clear definition as to why. The ability to create something, however abstract and share it is something precious and fragile. The recipient will almost certainly see something different from what the author first thought of, but this should be seen of as a gift. Art is not meant to simply convey a message, it’s meant to provoke a response. That could be something as simple as imagining a cat or as far reaching as starting a revolution. Art is powerful and words even more so. I’m just under a week into my challenge now and currently I have written approx 7500 words of the new book. While I am not quite on target at the moment I’m not too worried. I’ve found with writing books that the first 10,000 words or so take by far the longest. They are the words that are hardest to find, the characters are still not quite defined right and require thinking about more . Also I find about 90% of my research is needed in the first 10% of the book. However, I think it’s also fair to say I have been rather distracted and I wish to share a few of my distractions with you. The first was a link on a friends facebook page I found last Thursday. The moviebarcode website, where this one guy has taken every screen from a movie and put them all together in a row, then squished them all up into one image, just over 8 inches long. I was very distracted by these pretty pictures and they led to me thinking about movies and the overall impression a film gives. On page 3 of this guys website there is a beautiful green hued picture. Can you guess what film it is before you see the title? Well it’s The Matrix (surely all that green gave it away? ), I have to admit I couldn’t help wondering at this point if the second and third matrix films would be infinitely improved by being turned into one of these pictures instead. That wasn’t what got me thinking though. It was the next few pictures I saw. I started to go through and noticed that all the happy animated films like Toy Story and How to train your dragon had lots of lovely bright colours and made really pretty pieces. I began to wonder if the essence of these films was coming out in the 8 inch barcode made from them and it got me thinking. We put art on our walls because of how it makes us feel. Happy pieces often go up in hospitals etc to try and brighten the places up and I’ve heard of people randomly buying up artwork, because it makes them feel better about something, on some deep level they don’t fully understand. What if it’s like this with the films we watch as well? What if they actually leave an imprint behind on us, depending on the film we watched and the relative artwork within it? Would you start being more careful what films you watched? I think I just might. If I wouldn’t put a picture that made me feel depressed on my walls why would I watch a film that had the same undertones and left the same feeling behind just because it’s mildly entertaining? It doesn’t really make sense to. Take this next movie barcode for example. Would you hang this on your wall? I know I wouldn’t. It’s dark, oppresive and would just make me feel sad and overwhelmed everytime I looked at it. So I guess that means I won’t be watching The Dark Knight again. Just too much heavy atmosphere for it to be entertaining. I want to feel better after I’ve taken time out to relax and watch a film. If that’s all a bit too heavy for you, you can check out my much lighter distraction, that didn’t lead to much other than a debate on whether fuschia pink toilet paper was too much. All courtesy of Fiona Flame’s interior design blog last Friday. It’s available from redcandy.co.uk and they have toilet paper as well as kitchen roll and pocket sized packets of tissues in all sorts of funky colours. I have to admit I was quite tempted by the black toilet paper, even when Ms Flame informed her blog readers Simon Cowell uses it. You can check out the moviebarcodes here. Fiona’s interior design blog here. And the Fuschia toilet paper at the Redcandy store here. I don’t normally write reviews on movies, preferring not to over analyse why I do or don’t like something, but this being Disney’s 50th animated film and their 10th Disney Princess I wished to share my opinions. Now while I could talk about all the tiny things I noticed that would normally be commented on, like the ending being somewhat similar to Beauty and the Beast, or how funny yet moving some scenes were. I don’t actually want to review this movie. What I wish to do is talk about the whole Disney princess aspect. Needless to say, with the relative failing of last years Disney Princess in The Princess and the Frog my main concern was that this years, our reinvented Rapunzel, would not be relevant and as important as the others had been in reflecting the social status of women in their times and the recently changing way they define their roles in society. While Disney did not do an amazing job of making Rapunzel as socially important as say Mulan or Belle were at their points in time, they did make one point I loved, even though I’m not convinced it was intentional. Basically Rapunzel was kept in her tower by the woman masquerading to be her mother. She was manipulated into thinking that her mother knew best on the outside world and because Rapunzel was special and talented/had a gift she has to stay away from the outside world. Her mother told her it was because the world was dangerous and it was better for her to be safe in her tower. Before you get too ahead of yourself I am not trying to say people are too health and safety conscious and parents worry too much (though it is perhaps a valid point the film possibly makes), I actually felt that Rapunzel was being told her gifts and abilities were too good for the outside world and attracted danger and risk if she used them. That she should do something ‘safer’ instead; in this case stay at home with mum. Our western culture has become very concerned about our security and making sure we are in good safe jobs and careers and have a nice house, small mortgage, to the point that I think people are forgetting that sometimes you need to take a risk and try something different to really achieve things in life. This is a lesson even the film industry needs to learn as they prefer to make safe films that are remakes of old popular films or have plenty of merchandising to help counter any losses the film itself might make. The area where I feel this is having the most detrimental effect, however, is in creative people. I work with a lot of different artists, most of which are still trying to work out how they can earn enough money from their particular type of creativity. They range from writers, actors, and artists to musicians. Almost all of them talk to me about conversations they have had with their family (mostly parents) and occasionally friends where they have been encouraged and sometimes told to go get a ‘proper’ job in a different career. With the hope that this will lead to a steady income, a house, a spouse and anything else the teller thinks constitutes a successful life. It doesn’t seem to occur to the advisor that the person they are telling this to may actually be happier taking a risk. This could mean potentially only earning peanuts for the rest of their lives but getting to do something they enjoy for that low wage. As opposed to a dull 9 till 5 desk job that gives them no sense of satisfaction or achievement, even though they are paid twice as much (or potentially even more). Let’s face it, what would you rather have when you are old and infirm and sitting in a nursing home? Would you rather have happy memories of all the fun things you did your life or a whole load of money and nothing you can really spend it on? What do you think is going to be easier to get up for in the morning 20 years from now? A job you are passionate about most days or that same desk job you are doing only because it pays for 5 weeks of nice holidays per year? So next time someone tells you they don’t have a career per se, or that they are doing their art for money and still haven’t quite ‘made it’ yet. Rather than making them feel inadequate or unsuccessful, maybe think for a moment that actually they may be more right than wrong. They are going to quite possibly lead a happier more fulfilling life being true to themselves, than a person who spends their entire life trying to have the best paid career to retire at 65 still slightly unhappy. They may even have the potential to leave a legacy of inspiration and happiness to future generations. This is why I liked Tangled, because the new Disney Princess was once more relevant and suggested that it is much more important to be true to yourself and take risks than it was to be safe and bored. After all, if you want to learn to fly, you have to jump off a cliff.